Single Recirculatory Air Cooler/Freezer Conveyor Style Door | Dock Door Systems Inc.
More effective than an air curtain or strip curtain, the Enviro AirSeal® is a recirculatory air door system, that will significantly reduce ice, fog and moisture while dramatically increasing material handling. The AirSeal 620 is ideal for conveyor areas where unobstructed product flow and temperature control are critical. AirSeal’s invisible barrier allows for unobstructed product flow with minimal loss of refrigeration and/or heat gain. Significantly reduces fog, ice and moisture associated with wide-open conveyor openings. Adjustable louvers and air speed controls, allowing for precise application settings. Integrated heater unit for optimal air mixing temperature control and condensation reduction. Top down air flow for open roller converyors or horizontal air flow for belt conveyors. Air barrier return plenum for maximizing air recovery and recirculation. Integrated PVC strip curtains to maximize seal efficiency. Eliminates maintenance costs associated with hard panel doors.No need for energy absorbing infrared heat lamps. Reduction of ice, fog and moisture dramatically increases material handling and reduces maintenance. 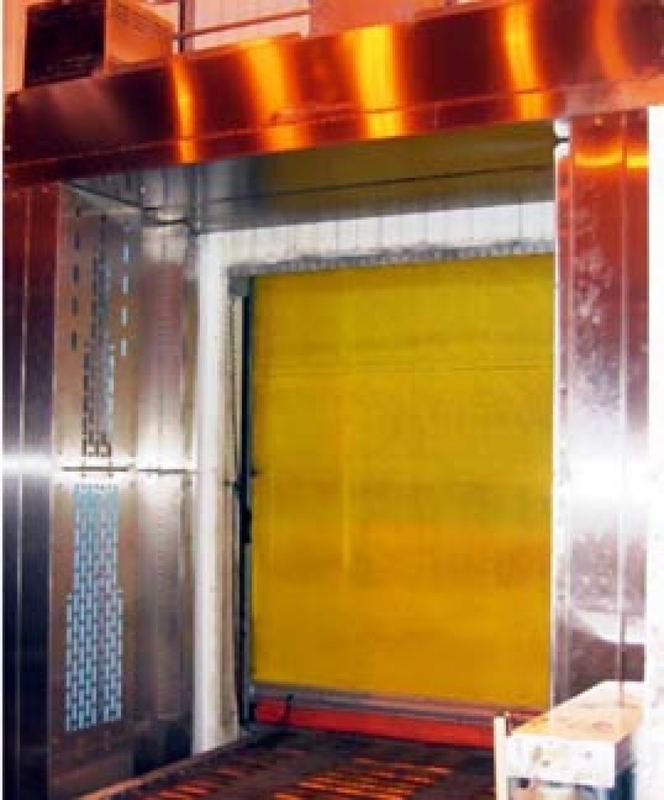 All galvanized or stainless steel design for cleanability. Integrated heater for freezer models. High efficiency low noise direct driven operator with minimum 2 h.p. motor. Electric operation: AirSeal - 2,050 cfm at 2” of water gauge. Manual power sliding insulated cooler/freezer door. 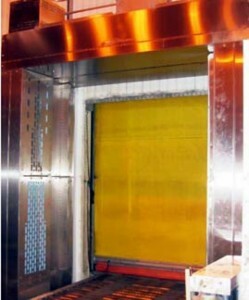 Vertical air flow (consult factory).